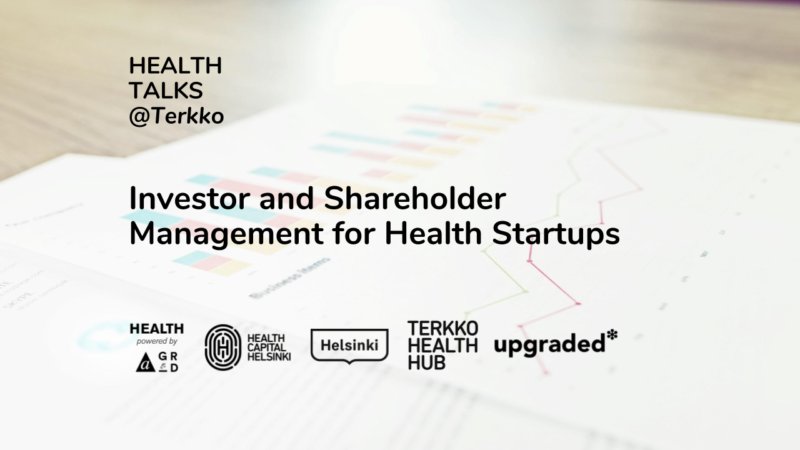 Welcome to another event from the Health Talks series – entrepreneurship, health and life sciences talks organized by Health Powered by A Grid, Health Capital Helsinki, NewCo Helsinki, Terkko Health Hub and Upgraded – Health Startup Association of Finland. In this event you will learn to understand the importance of investor and shareholder management and learn about a new service that makes it easier. If you are planning to begin an investment round, work in a startup or are planning to found one, this is for you! We are happy to welcome everyone interested in the topic. Ville Niemijärvi from Onervahoiva will speak from the startup perspective and share his experiences on investor and shareholder management and communication. Onervahoiva is currently raising a seed round of investments, with the target of raising 500 – 750k€ of funding. They have previously closed 100 000€ pre-seed funding in 2017. Kasper Suomalainen from Superhero Capital will tell us from the investor point of view, why it is important to keep your current and prospective investors informed about your company’s status. Frank Sjoblom from Unlisted will speak about investor and shareholder management and present their new platform which makes it easy, simple and effortless. As a new member benefit, the Unlisted platform will be offered free to all Upgraded member startups! Onerva is a communication platform for all participants involved in elderly care: nursing homes, doctors, physiatrists, occupational therapists and the relatives. Onerva’s current solution is an instant-messaging service, a “whatsapp for eldercare”, which allows real-time, secure communication between nurses, customers and their families. Onerva digital notebook is used all over Finland both public and private sector and it has users in Sweden, Germany and US. Now Onerva is developing a voice-controlled digital assistant for eldercare, called Onerva Bot. Superhero Capital is a venture capital fund who invest mainly in early stage B2B companies; health tech being one of the industries they often look at. The most recent addition to their portfolio is Adesante, whose expertise is in 3D medical imaging for surgery planning with virtual reality. Unlisted makes Investor and Shareholder relationship management easy, simple and effortless. With the Unlisted platform you can easily provide information and news to investors and shareholders about your company. For investors, Unlisted makes it easier to follow multiple companies at once. Unlike other services, Unlisted automatically collects information and sends updates of financial information and news to investors and shareholders. Unlisted also provides a detailed analysis of member companies, done by their financial experts. We hope to see you at Terkko! Share with friends and click “Going” in Facebook! The event is organised by Health powered by A Grid, Health Capital Helsinki, NewCo Helsinki, Terkko Health Hub and Upgraded – Health Startup Association of Finland.